# "R" Engine Maintenance and Rebuild. # "Y" Engine Maintenance and Rebuild. # "3VZ-E" Engine Maintenance and Rebuild. # Carburettor Fuel Systems: Y, R, 4Y Engines. # Electronic Fuel Injection: 3V-ZE EFI, 4Y-E EFI. # EFI Fault Diagnosis and ECU Information. # Manual Transmission: "G", "L" and "W" Series. # Automatic Transmissions: A430H, A42D, A43D, A42DL, A43DL and A43DE. # Drive / Tail Shaft and Universal Joints. # Rear Axle and Differentials. # Lights, Switches and Battery Systems. # Electrical Wiring and Fuses. The Toyota Hilux actually series of lightweight pickup trucks created and sold by the Japanese producer Toyota. Many countries put the Hilux title for the whole lifetime of the show however in united states, the Hilux title ended up being resigned in 1976 in favor of vehicle, Pickup Truck, or lightweight Truck. In the united states the popular solution package, the SR5, had been colloquially put as being a design title when it comes to vehicle, although the solution bundle has also been used on other Toyota products like Corolla. In 1984, the Trekker, the camper form of the Hilux, is rebranded as the 4Runner in Australia and the united states, so when the Hilux search in Japan. In 1995, Toyota introduced a fresh pickup design, the Tacoma in North America, discontinuing the Hilux/Pickup truth be told there. The 4Runner has become a complete SUV, and the newer versions try not to resemble the Tacoma. By 2014, the Toyota Hilux is present around the globe, except Japan, United States, Canada, North Korea, and South Korea. Fuel injections is a system for admitting gasoline into an interior combustion engine. It's end up being the major gas delivery program found in automotive machines, having changed carburetors throughout the 1980s and 1990s. A number of injections methods posses existed because the original use of the interior combustion motor. The principal distinction between carburetors and gasoline injections is that gas shot atomizes the gas by forcibly pumping it through a tiny nozzle under high-pressure, while a carburetor utilizes suction developed by intake environment accelerated via a Venturi pipe to-draw the fuel into the airstream. Modern fuel injections systems are designed especially for the kind of gasoline used. Some techniques are made for several grades of gasoline. Many fuel injections techniques are for fuel or diesel applications. An average fuel injector uses a solenoid to move a pintle vavle to permit reasonably reasonable fuel pressures to flowing past, forming an injection "cone". Typical Multi-Port gas injection pressures were 45-80PSI. Throttle human body injection pressures are generally 10-20PSI. A traditional diesel shot system works very in a different way. A "distributor-style" or "inline-style" shot pump uses up gasoline, either with the aid of a offer pump or occasionally they have a integrated raise pump. The pump pressures towards the injections pump off the raise pump usually are 4-10PSI. Within the injections pump, gas are pressurized to 2000-6000PSI typically. Within the classic injections program, this pressurized gas will flow by way of a high-pressure injector tube from shot pump towards the injectors. The injectors posses internal detents and spring systems set-up in order for them to "pop" or open in a specific stress. This style of injector features ZERO electronic support. Once force is built to the "pop" aim, it really is inserted into either a pre-chamber or directly into a bowl in the piston and stays open until stress inside pipe are bled listed below the "pop" point of which the pintle closes once more. There are various other types of injections in a diesel engine, one of which which is also unassisted by electronic devices uses a central injection pump that pressurizes all injectors to approximately 20-35000 PSI. A passionate lobe on the camshaft wil after that actuate the injector. Many heavy-duty diesel motors use this program, additionally the VW TDI Pumpe-Duse runs on the variation of this system. Then we struck into electronically assisted setups. Among which is the HEUI- Or, Hydraulic Electronic Unit Injector. The 7.3L Powerstroke is one of significant motor to use this method. I'm not 100% on HEUI principle, but We ll manage my most readily useful. Within, gas comes using a train into the injectors at relatively low pressure and ruthless oil is supplied with a separate railway to some other slot in the injectors. If the injectors are signalled to turn on, the questionable oil flows in above an "intensifier" piston together with gas moves in the following. Off, in addition to gas try permitted to move from the nozzle. The differential in sizes of piston touching the oils plus in connection with the gas causes a multiplication force, where in actuality the gas leaving the nozzle try around 20-30,000PSI. One notable feature associated with the HEUI injector is the fact that it's repeatedly larger than every other diesel injector design. The most up-to-date connection towards familiy is the Common Rail injection system. Again, a main pump pressurizes the gas rails to about 30,000PSI. There are 2 forms of injector utilized in this setup. Either A) the solenoid injector. Quite similar in principle to a gasoline injector, but much burlier, once we were working with thousands of PSI stress, maybe not tens of PSI. Or B) The Piezoelectric injector. I'm not very yes the way the Piezoelectric injectors jobs, but I do know these are the quickest, many exact control-system for injectors now available. They permit much better control over the fuel injection period, permitting a quieter, better, additional gasoline efficient, and lower emissions motor. When you have the elderly design with an shot pump causing the non-eletronic injectors, do some studies on things like pop-test calibrations. Furthermore, strike up some diesel forums and employ the research work. In May 1972, the 1973 model season Hilux was released given that RN20. A far more comfortable indoor was specified with exterior revisions. A 2.25 m "long bed" ended up being a choice the very first time in North America, although this variation have been readily available global since April 1969. This gotten the "RN25" chassis signal. The 2.0 liter 18R engine became obtainable in late 1973 in Japan also, albeit only along with a three-speed automatic transmission. The Hilux is drastically redesigned in 1975 is bigger along with increased standard equipment. In North America the newest variation also suggested the introduction of the dramatically larger 20R motor and the SR5 upscale trim package. A five-speed handbook transmission became optional. 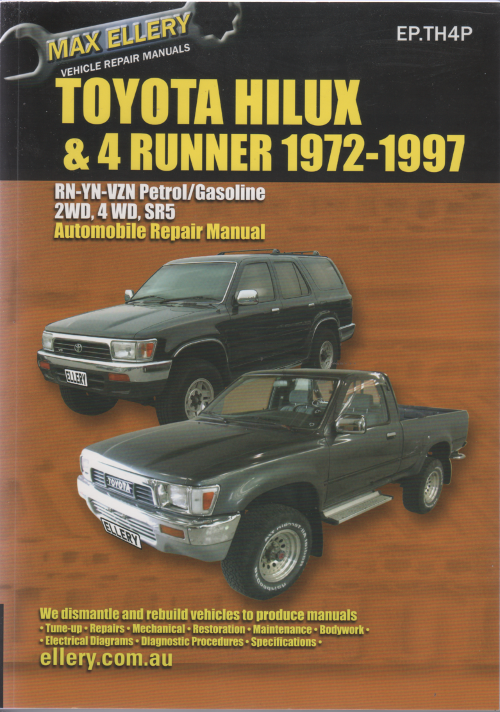 In North America, the Hilux name was totally phased out and only "vehicle" by that season, creating already been dropped from literature and marketing starting in 1973. The redesigned Hilux is introduced in August 1978, through a 4WD variant introduced in Jan 1979. The 4WD variant -- maybe not supplied with any motors smaller compared to the two-litre "18R" -- showcased some traditional technology with all the larger Toyota Land Cruiser. Production of the four-wheel drives stopped in July 1983, many 2WD variants carried on in parallel utilizing the next generation. The L-series diesel motor had been provided on the 2WD alternatives from September 1979 additionally the 4WD variations in March 1983. In Japan, the Hilux was accompanied using new Toyota MasterAce, revealing burden carrying responsibilities, and marketed at Toyota Store areas alongside the Hilux. In North America the Hilux spotted employing four-wheel drive. They had been solid front side axle and leaf suspension. The human body spotted a redesign that included single round headlights as well as a less complex body. This newer 4WD setup featured a gear driven RF1A transfer circumstances. This transfer instance is exclusive in that its low-range decrease portion is replicated, making use of what some refer to as double or triple transfer instance. This causes a much lower general gear proportion. It had been initial Hilux readily available having an automated transmission. In 1981 a car developing contract was founded between Toyota, Winnebago Industries as well as 2 other aftermarket customizers. It was to permit Toyota to enter the SUV markets in North America. The motors which resulted from this collaboration are the Trekker, Wolverine, and also the Trailblazer. All three put the Hilux 44 RV cab and chassis, as well as an all-fiberglass rear area. There were at the least 1,500 Trekkers, 400 Trailblazers and an as yet not known number of Wolverines marketed in North America. Research and developing work with the Trekker resulted in the development of the 4Runner/Hilux Surf, that has been released in 1984. Toward the termination of the SR5 s manufacturing run, Toyota launched the luxury Mojave for the people markets as being a limited-production design with alternatives not available on virtually any Toyota pickup. Record coming in at US,308, it showcased bucket seating, two-speaker multiplex radio, chrome front side and back bumpers, no Toyota logo design on either the grille or tailgate. Cruise control, energy steering, and ac were optional. It had been powered by the SR5 s standard 2.4 L inline four. Single-point shot uses a single injector at throttle human body. It had been launched into the 1940s in huge aircraft motors as well as in the 1980s in the automotive world. Since the gasoline passes through intake runners, it's called a "wet manifold system". The reason for single-point shot had been low-cost. A number of the carburetor s encouraging components- like the air cleaner, intake manifold, and fuel range routing- might be used again. This delayed the redesign and tooling outlay of these components. Single-point injections was used extensively on American-made traveler vehicles and lighter vehicles during 1980-1995, plus in some European cars in the early and mid-1990s. Inside a constant injections program, gasoline flows at all times through the gas injectors, but at variable flow rates. This is certainly contrary to greatest fuel injections systems, which supply fuel during brief pulses of differing duration, by having a constant speed of flow during each pulse. Continuous injection systems can be multi-point or single-point, not direct. The most common automotive continuous shot system are Bosch s K-Jetronic, launched in 1974. K-Jetronic was utilized for a long time between 1974 in addition to mid-1990s by BMW, Lamborghini, Ferrari, Mercedes-Benz, Volkswagen, Ford, Porsche, Audi, Saab, DeLorean, and Volvo. Chrysler put a consistent gasoline injections system on the 1981-1983 Imperial. In piston aircraft motors, continuous-flow fuel injections is the most typical kind. Contrary to automotive gas shot techniques, plane continuous circulation fuel injections is all mechanical, requiring no electrical energy to use. Two common kinds exists: the Bendix RSA system, and TCM program. The Bendix program is just a direct descendant of this force carburetor. However, in place of creating a release device when you look at the barrel, it works on the flow divider installed on the top of motor, which controls the discharge rates and uniformly distributes the gas to stainless steel shot outlines into intake harbors of each cylinder. The TCM program is even more simple. This has no venturi, no force chambers, no diaphragms, with no release device. The control product are fed by a constant-pressure gas pump. The controls product simply runs on the butterfly device when it comes to air, which will be linked by way of a technical linkage up to a rotary valve for the gasoline. Within the controls device is yet another constraint, which manages the gas combination. The pressure drop throughout the restrictions in the control device manages the amount of fuel-flow, making sure that fuel-flow try straight proportional to your force within movement divider. Actually, most plane which use the TCM gasoline injections system feature a fuel flow gauge this is certainly actually a pressure gauge calibrated in gallons per hour or pounds hourly of gas. The August 1983 redesign introduced the Xtracab, two-row longer taxi option. These "1984" products carried throughout the carbureted 22R engine while design 12 months 1984 also saw the development of the fuel injected 22R-E. Two diesel machines are additionally supplied, the 2L plus the turbocharged 2L-T. The diesels were stopped in U.S. after the 1986 design 12 months, this is due to higher performance objectives from consumers in addition to wider accessibility to inexpensive fuel. The next season spotted the introduction of a turbocharged solution, the 22R-TE, perhaps due to increasing competitors from Nissan whom currently supplied a V6 vehicle today. The solid front side axle had been swapped out for the independent front suspension/torsion bar setup when you look at the 44 model in 1986, and optional automatic differential disconnect the front side differential as well as an digital transfer case was included also. A V6 engine is launched in 1988. The Hilux-based 4Runner which made their entry in Australia, North America as well as the great britain ended up being based on this generation Hilux; in a few more areas, including Japan, it was known as the Hilux Surf. Toyota launched a fresh generation associated with the Hilux in most areas in late 1988 although fourth generation remained in manufacturing until 1997 in South Africa. Toyota states this is considering South African "content regulations" which managed to get inexpensive to continue to produce the 4th generation Hilux, rather than to retool the plant for the 5th generation. Diesel engines are created with two notably different shot locations. "Direct" and "Indirect". Indirect injected motors place the injector inside a pre-combustion chamber in the mind which because thermal losses usually need to have a "glow plug" to begin and incredibly high compression ratio. Usually inside variety of 21:1 to 23:1 ratio. Direct inserted engines make use of a typically donut formed combustion chamber void on the top of this piston. Thermal effectiveness losses were significantly lower in DI engines which facilitates a reduced compression proportion typically between 14:1 and 20:1 but the majority DI machines were closer to 17:1. The direct injected processes try significantly more internally violent and thus needs careful build, and more sturdy building. The reduced compression proportion in addition produces challenges for emissions because of limited burn. Turbocharging is very suitable for DI machines since the low compression ratio facilitates meaningful forced induction, and the escalation in airflow allows acquiring additional gasoline efficiency not merely from additional total combustion, but also from decreasing parasitic efficiency losings whenever properly run, by widening both power and performance curves. The violent combustion process of direct injections additionally brings most sounds, but contemporary styles using "separate shot" injectors or similar multi chance processes have actually significantly amended this matter by firing a tiny charge of gasoline before the primary shipments which pre-charges the burning chamber for a less abrupt as well as in many cases a little cleaner burn. A vital element of all diesel engines is just a technical or electronic governor which regulates the idling speeds and greatest speeds associated with motor by managing the speed of fuel delivery. Unlike Otto-cycle machines, incoming air is certainly not throttled plus diesel motor without any governor cannot have a stable idling speed and will quickly overspeed, resulting in their destruction. Mechanically governed fuel shot methods tend to be driven by the motor s gear train. These methods work with a mixture of springs and weights to manage gas distribution in accordance with both burden and speeds. Modern electronically monitored diesel machines get a grip on gasoline shipments by use of an electric control component or electric controls product. The ECM/ECU gets an system speed signal, and also other running parameters including intake manifold stress and gas heat, coming from a sensor and controls the actual quantity of gas and start of injection timing through actuators to increase energy and efficiency and minimise emissions. Controlling the time of this start of injection of gas to the cylinder is really a key to minimizing emissions, and maximizing gasoline economic climate, associated with the system. The time try measured in degrees of crank perspective regarding the piston before top dead centre. If the ECM/ECU initiates gasoline injections if the piston was 10 before TDC, the beginning of injections, or time, was said to be 10 BTDC. Ideal time is determined by the system build and their speeds and burden, and it is typically 4 BTDC in 1,350-6,000 HP, web, "medium speed" locomotive, marine and fixed diesel machines. Advancing the start of injections leads to greater in-cylinder stress and temperatures, and greater efficiency, but in addition leads to enhanced engine sounds because quicker cylinder stress rise and enhanced oxides of nitrogen formation as a result of greater burning conditions. Delaying beginning of injection produces incomplete burning, reduced gasoline performance as well as an increase in exhaust smoke, containing a great deal of particulate situation and unburned hydrocarbons. The next redesign, in 1988, produced a longer-wheelbase alternative, 3,099 mm in the place of 2,616 mm for regular wheelbase. Their single-piece cargo-box wall space removed the rust-prone seams that were found in earlier in the day brands. The V6 Xtracab SR5 made engine Trend magazine s Truck of the Year award that year. The Xtracabs now showcased even more area behind the leading seats compared to final generation which let recommended jump-seats for rear passengers, an element considerably consistent with competition of that time. In 1991, US production started at the NUMMI plant in Fremont, California, however some vehicles sold in america during the 91--95 design years were still manufactured in Japan. The Hilux obtained a renovation in 1991, which was a minor barbecue grill changes while the brand new Toyota emblem that were recently followed. It was with this generation that Toyota stopped the Hilux in the us, changing it utilizing the brand new Tacoma in 1995. Within a direct injections engine, gas is inserted in to the combustion chamber in place of injection before the intake device or a split pre-combustion chamber. Within a common train system, the fuel from gas container is supplied on typical header. This gasoline will be delivered through tubing towards injectors, which inject it to the burning chamber. The header possesses ruthless relief device to steadfastly keep up the stress within the header and return the excess gasoline to the gasoline container. The gas try dispersed by using a nozzle this is certainly launched and closed having a needle device, managed by having a solenoid. As soon as the solenoid is certainly not triggered, the spring forces the needle valve to the nozzle passage and prevents the injections of gasoline into the cylinder. The solenoid lifts the needle device from valve chair, and fuel under great pressure is sent in the engine cylinder. Third-generation common train diesels usage piezoelectric injectors for increased precision, with fuel pressures up to 1,800 bar or 26,000 psi. Direct gasoline injections costs above indirect shot techniques: the injectors face most heat and stress, so more pricey components and higher-precision electric administration techniques are expected. Many diesel machines has gas injected into the burning chamber. Earlier on systems, depending on simpler injectors, frequently injected as a sub-chamber shaped to swirl the compressed air and improve combustion; this was called indirect injections. But this is less efficient as compared to today typical direct injections in which initiation of combustion happens inside a despair into the crown regarding the piston. Through the early history of diesels, these were constantly fed by a technical pump through a small split chamber per cylinder, feeding individual fuel outlines and individual injectors. More such pumps had been in-line, although some are rotary. Modern diesel engines need typical railway or unit injector direct shot techniques. In winter, high-speed diesel motors are difficult to beginning due to the fact size of the cylinder block and cylinder mind take in the warmth of compression, avoiding ignition as a result of the greater surface-to-volume ratio. Pre-chambered engines utilize smaller electric heaters inside the pre-chambers called glowplugs, although the direct-injected engines posses these glowplugs in the burning chamber. Many motors incorporate resistive heaters into the intake manifold to heat the inlet environment for starting, or through to the engine hits operating heat. System block heaters connected to the energy grid are used in cold climates when an system try deterred for longer periods, to reduce startup time and system wear. Block heating units will also be employed for emergency energy standby Diesel-powered generators which must quickly get load around energy failure. Previously, a wider variance of cold-start techniques were utilized. Some motors, eg Detroit Diesel engines utilized something to establish a small amount of ether into the inlet manifold to begin combustion. Other individuals put a combined system, by way of a resistive heater burning up methanol. An impromptu process, particularly on out-of-tune engines, should by hand spray an aerosol can of ether-based engine starter substance into the intake air flow. The electric starter motor or starting motor is one of typical kind used on gas engines and tiny Diesel engines. The present day starter motor try the permanent-magnet or a series-parallel injury direct current electric engine by having a beginner solenoid mounted on it. Whenever existing from starting battery are applied to the solenoid, generally by way of a key-operated change, the solenoid engages a lever that pushes out the drive pinion regarding the starter driveshaft and meshes the pinion using starter band gear on flywheel of this motor. The solenoid in addition closes high-current associates when it comes to starter motor, which starts to change. Once the engine begins, the key-operated turn are opened, a spring into the solenoid system pulls the pinion gear from the ring equipment, together with starter motor stops. The beginner s pinion try clutched to its drive shaft via an overrunning sprag clutch which permits the pinion to transmit drive in only one way. In this way, drive are sent through the pinion on flywheel ring gear, however pinion continues to be engaged, the pinion will spin individually of its drive shaft. This prevents the engine driving the beginner, for these types of backdrive would cause the beginner to twist therefore quickly regarding travel apart. However, this sprag clutch arrangement would preclude the usage the beginner as being a generator if used in crossbreed scheme mentioned above, unless alterations had been made. Additionally, a standard starter engine is just made for intermittent use which will preclude its use as being a generator; the electrical equipment are made only to function for usually under 30 moments before overheating, to truly save fat and value. Here is the same reason why many vehicle owner s guides instruct the operator to pause for at the very least ten seconds after each ten or fifteen moments of cranking the motor, when wanting to begin an system that will not beginning instantly. This overrunning-clutch pinion arrangement had been phased into usage from the early 1960s; before that point, a Bendix drive was made use of. The Bendix system places the starter drive pinion for a helically slice drive shaft. Once the starter engine begins turning, the inertia associated with drive pinion set up trigger they to ride forth from the helix and so engage with the band gear. If the engine begins, backdrive from ring gear produces the drive pinion to surpass the rotative speeds of the beginner, where aim the drive pinion was forced back the helical shaft and therefore off mesh using the ring equipment. Problems playing this file? See news help. An intermediate development involving the Bendix drive developed within the 1930s additionally the overrunning-clutch designs introduced inside 1960s is the Bendix Folo-Thru drive. The standard Bendix drive would disengage from band equipment when the motor fired, although they failed to continue steadily to operate. The Folo-Thru drive has a latching system plus collection of flyweights in the body for the drive product. As soon as the starter engine starts switching additionally the drive unit was required forward regarding the helical shaft by inertia, it's latched to the engaged position. Just once the drive product try spun in a rate higher than that achieved by the beginner engine it self will the flyweights pull radially outward, releasing the latch and permitting the overdriven drive unit to be spun-out of engagement. In this way, undesirable beginner disengagement was averted before an effective motor begin. A disc brake is just a wheel brake that slows rotation associated with wheel by the rubbing caused by pushing braking system shields against a braking system disk by having a group of calipers. The brake disc is normally made of cast iron, but may sometimes be manufactured of composites such as for instance strengthened carbon--carbon or ceramic matrix composites. This is certainly attached to the wheel and/or the axle. To avoid the wheel, rubbing information by means of brake pads, installed on a computer device called a braking system caliper, was pushed mechanically, hydraulically, pneumatically, or electromagnetically against both side associated with disc. Rubbing causes the disc and affixed wheel to slow or end. Brakes convert motion to temperature, and in case the brakes bring also hot, they be less effective, a phenomenon generally brake fade. On vehicles, disc brake system tend to be operating in the wheel. The growth and employ of disc-type brake system started in England when you look at the 1890s. The very first caliper-type automobile disk brake ended up being branded by Frederick William Lanchester in his Birmingham, British factory in 1902 and utilized successfully on Lanchester vehicles. In comparison to drum brakes, disc brakes promote better stopping results, considering that the disc is more readily cooled. As a consequence disk brake system is less at risk of brake fade, and retrieve more quickly from immersion. Many drum brake styles posses a minumum of one leading shoe, gives a servo-effect. By comparison, a disc braking system doesn't have self-servo effect and its particular braking force is always proportional into the force put on the braking system pad by the stopping system via any brake servo, stopping pedal or lever. This tends to give the driver better "feel" in order to prevent impending lockup. Drums are at risk of "bell mouthing", and pitfall worn lining product within the system, both factors that cause different braking dilemmas.